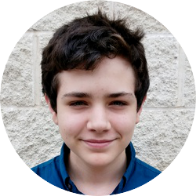 My name is Jonah Schwarz-Mullins and I am currently a Junior at Yavneh Academy of Dallas. To me, math has always been my favorite subject. I only began to appreciate this once I realized the importance of math in our daily lives. From science to engineering, math is the cornerstone for all the professions that pave the way for the technology of the future. The intricate ways that math is utilized in everyday items such as computers, phones or even our food are very rarely considered by many. That’s why I believe that an appreciation for mathematics is important for modern-day people; math is a necessary but unnoticed part of everything that we use or do.